Love this ! Would buy again .. Create a sleek, streamlined hairdo with this straightening iron. Offering extra-long plates and multiple heat settings, this iron features a compact design to minimize fatigue during use. I love this flat iron, you need no more than two swipes really and it leaves the hair Incredibly sleek. Just be careful with the temperature settings! I have curly, hard to straighten hair so I really appreciate a good straightener. This smoothes my hair with the titanium plates and heat settings. I noticed that when my hair stylist flat ironed my hair she did it fast, usually with one pass-through per part and my hair would not only be straight, but also shiny and silky. When I did what seem to be the same process at home that even after severely passes my hair would not only be as straight as my stylist got it, but also did not have the same shine and silkiness. During a discussion about this with a couple of ladies, one asked me how old my flat iron was and what price range. I replied, it was at least 5 years-old and between $19 to $30. They both told me it was time to invest in a higher quality new one. It was also suggested that I purchase the same one my stylist uses, which is a Babybliss Flat Iron. My did my research and decided to invest and make the purchase. I am so pleased with my purchase and the results. My hair is just as nice - very straight, shiny and silky with just one pass-through like when my hair stylist does it. I highly recommend the Babybliss Flat Iron. Flat iron works very well!! 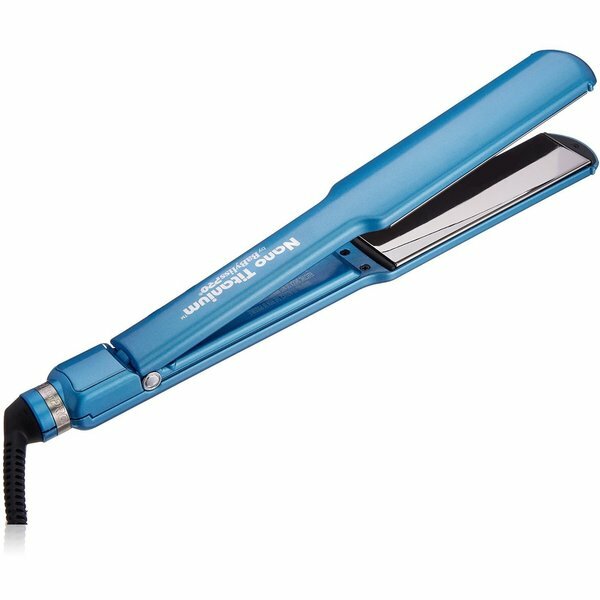 Hair glides easily between the titanium plates, 1.5” plates make flat-ironing faster, and unit heats up quickly and is true to temperature. My daughter loves this iron. It doesn't burn your hair or dry your ends out . It has adjustable heat settings so depending on your type of hair it can be adjusted. I was long overdue for a new iron and this one I would highly recommend. Couldn't live without this product! I love this straightener, and feel that the money I spent on oter products was a complete waste! I won't waste my time nor money on any other brand. I'm very satisfied and relieved to have found this straightener. I love my BabylissPRO Nano Titanium Iron. I used it to straighten my hair it left my hair so shiny and beautiful. It heats very quickly, the sleekness of the iron is great well worth the money. This is a good iron. Auto shut down and plenty of temperature settings. It also has a long cord. Easy to use and a good upgrade from my 1- inch non-titanium-plated flat iron! This is by far the best hair straightening iron I ever owned. I have used it for over 10 years and the iron works just like the first day I used it. The plates get very hot quickly and the plastic casing allows the item to sit on your counter without melting or burning. There is also a heat adjusting dial that gets very high temperature. This is the third time I purchase the same flat iron, not because it’s damaged but because I love it so much. I’ve only had to buy 2 in the course of 15 years and the third I bought as a gift. I bought this for my daughter’s hair. She has a curly and thick hair. The hair stylist advised to get this straightener. We are happy with this purchase. So far I am completely in love with this flat iron. It really does the job well and curls beautifully if you know how to really work a flat iron. It came in original packaging and I do hope that it lasts awhile. I’ve always wanted a flat iron from babyliss pro! Bought this for my daughter and she absolutely loves it. Straightens her hair just perfect in a much shorter time. Would completely recommend this one!!!! My favorite flat iron. My last iron lasted for many years. Fantastic straightener! It is a little pricier than most other straightener’s that I have owned but it works so much better than they did. This flat iron works very well I bought it for my wife and she has long thick very curly frizzy hair and she said she only had to use one to two passes through! The shipping did take awhile though. I’ve been using this for a year now and it works so good. One of the best straighteners I’ve ever used. My daughter who has very curly hair recommenced this and said it’s the only straightener that really works on her hair. I’ve been using this flat iron for 7 years! This is my third one as I have broken others by my own fault, they are surprisingly sturdy and the best I’ve ever used. I have wavy/curly very voluminous and frizzy damaged hair that I get colored quite often, this straightener makes my hair look so smooth and glossy, not to mention I curl my hair with it too and people always ask me how I curl my hair. So easy with this flat iron, I can not recommend it enough nor will I ever stop using it! Best flatiron I have ever owned in my life!!!! "Why does it say country of origin is China? The authentic one is from Italy." Hello, yes this item is from Italy. All babyliss come from Italy. There is an error regarding that and we are going to update it now. "Does this have auto shut off?" To the best of our collective knowledge this is not a feature on any of these irons. "hello, i want to make Sure that this isn't a counterfeit product, is there any way that the customers can get the serial number to confirm with the manufacturer that this is an authentic product? Many counterfits have imitation packages as well. Also the description reads that it's a origination is in China." "is this flat iron dual voltage ?" We have one. Need another and love this one. It’s a good product. Bought one 3 years it stop working just a few days ago. "I would like to purchase this item but while checking reviews I have learned that there are a lot of counterfiet products being sold and shipped, Is this product authentic?" Hello dlgn8c, this is an authentic BaByliss Pro Nano Titanium 1.5-inch Flat Iron. It comes in its original packaging. Thanks for shopping with us! L.B.